We are excited to present our Spring Sale of Heavy Hitters and the re introduction of Apricots! To celebrate the release of 2010 Apricots and our Spring Sale we’ll have live music and a tasty food truck at the tasting room on Saturday March 11th from 5 to 8pm. All 5 of the Spring Sale wines will be available to purchase by the glass or bottle. Many of you have become familiar with our wine club releases; this is different. For two weeks only, we are offering a special set of wines with a mix-and-match discount of 20% for 6 or more bottles. We’re especially happy to highlight the comeback bottling of our “Apricots” blend. For a little background check out my note about the fabulous 2010. Going forward we’ll release a new Apricots vintage every spring, so the wine will always have 5 years of bottle age at release. This is one for the collection, as it’s going to go fast (we made only 4 barrels) and it’s going to age a good long time, just like the original from the 1995 vintage. 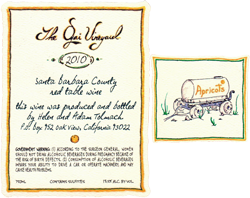 Along with Apricots, we’ve selected four other wines for this sale that we feel are superb. We think all our wines are special, but this selection is packaged together because we’re super excited about how they’re drinking now, and we’d like to share them with you. Please scroll below for more information on each of these wines. And don’t delay, it’s just a two-week offering and we expect these wines to move quickly!